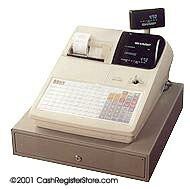 Sharp ER-A470 Electronic Cash Registers at Cash Register Store. PRODUCT DISCONTINUED. ACCESSORIES AND PARTS STILL AVAILABLE! The ER-A470 offers advanced features and convenient functions which will enhance the operation of your restaurant. Innovative features such as the standard infrared interface, optional programming remote keyboard, and easy programming function expand your capabilities while simplifying procedures. The ER-A470's unique infrared interface allows the user to program and reprogram the unit quickly and easily. 3 programming input devices include the optional programming remote keyboard, personal computer, and Sharp Wizard personal information organizers withn I/R capability. For easy programming the operator is guided through simple programming tasks by the machines prompted programming. This foolproof programming method eliminates unnecessary service calls and allows the user to program and modify the terminals simply and efficiently. 10 digit numeric second line.